Talks by designers, practitioners and professionals. Ben’s house was featured on Channel 4’s ‘Grand Designs’. He lives and works at Prickly Nut Woods in West Sussex, where apart from making a living from coppicing he trains apprentices and runs courses on sustainable woodland management, ecobuilding and permaculture design. 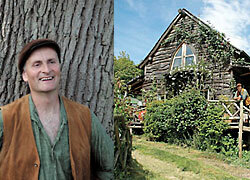 He runs a specialist ecobuilding company The Roundwood Timber Framing Company Limited. This specialises in the supply of roundwood construction timber and a building and project management service. Steven worked on the innovative Downland Gridshell building at Edward Cullinan Architects, leaving in 2003 to establish The Architecture Ensemble to pursue timber architecture. This talk will be a double case study focusing on the Downland Gridshell at Weald & Downland Open Air Museum and his work at the Woodland Enterprise Centre at Flimwell. Steven will describe how these projects are direct architectural responses to the conditions found on these particular sites and across the region within which they were and are being built. Both projects make innovative use of locally and regionally grown timber. Tim is operations manager for BioTecture, installing plants grown vertically in a hydroponic system for clients. Benefits of green walling include reduced thermal loading on buildings, natural air filtration, reduced heat island effect, sound attenuation, creation of urban ecological habitat, urban food walls and of course, exciting and uplifting human urban environments.